Bringing back an old franchise that withered isn't easy. Bringing back Medal of Honor the way it's coming back this year? That's hard. 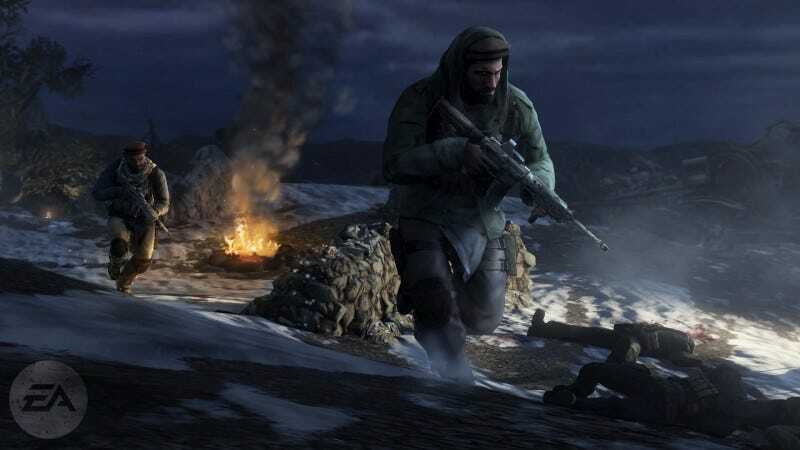 At an Electronic Arts press event in New York City, I recently had a chance to check out the new Medal of Honor, witnessing a small piece of the game's military adventure in Afghanistan. I knew I was witnessing an attempted comeback, the resurgence of a once glorious franchise that had last murmured with 2007's Medal of Honor Airborne. And I knew the new game had two development studios, EA LA for the single-player and Battlefield-makers DICE for the multiplayer. I hadn't thought through just how hard EA must be pushing this title to contend with the big boys in the genre, Modern Warfare 2 and its ilk. " It certainly shows the commitment on the part of EA that they care about this franchise, because this certainly isn't the most economical way of doing it," the game's executive producer, Greg Goodrich told me. This is a game with not just two development teams, but two game development engines. EA LA is building their campaign using Unreal Engine 3. DICE is using its Frostbite engine. Maybe even harder than that will be the EA LA team's attempt to tell an exceptional story. In my interview with Goodrich, he emphasized that this game's campaign would be about the experiences of a group of men in the real and current war in Afghanistan. "We're focusing on the foot solider," he said. "The best way I heard it said, by one of our consultants, is that it's not about the hate of the enemy but it's about the love for the brother behind me. I'm going home. He's going home. That's the point we're taking. It's not about the enemy. It's about brotherhood." This new Medal of Honor occurs during the first half of the U.S.-led NATO war in Afghanistan. The enemy is Al Qaeda, the Taliban and foreign fighters from places such as Chechnya. These enemies gamers will fight are "what our men and women are facing right now [in Afghanistan,]" Goodrich said. "It's a new enemy and it's an unpredictable enemy." Players can expect guerrilla tactics, tricky urban combat and more. The game's campaign will stretch from city slums to mountain sides. They're not the familiar military shooter Nazis. There is more than one lead character in this game. Players will get in the boots of an unspecified number of combat veterans. They are fictional, though their experiences are based on those of special forces. A trailer going live this week showcases the two types of soldiers the player will become: a part of the "scalpel" and a part of the "sledgehammer." Think of the player having turns at being both a quiet assassin to an Army Ranger caught up in the heat of a big battle.The scalpel are the elite forces who surgically achieve military goals with stealth and deadly proficiency. The sledgehammer are the ground troops, the troops who attack in large numbers. I saw a little of the scalpel in the New York event, sadly without any clear example of that storytelling drama coming to the fore. That's not to say it seemed bad. The game, running in Unreal Engine 3 looked solid. The mission was set on snowy Afghan mountains near the Shah-i-kot valley while the sky was darkened though not fully night. Our character and his buddies were sneaking through to try to take out anti-aircraft guns. They attacked some enemies and moved on. A friendly plane flew in to provide supporting fire. Then, an enemy convoy rolled through, driving through a distant pass and blinking with strobe signals placed on their vehicles by the player in an earlier mission. The beacons were all our guys needed to call in an attack. Goodrich, who was demoing the game, called in an air strike. Thanks to the mountain and valley setting, the brief engagement I saw had a more vast visual scope than I'm used to seeing in this kind of shooter. Most of the vista we could see was nature — mountains and big sky — but the fighters and vehicles were made to feel all the more part of something grand, if not something overly busy and crowded. This combat had visual depth and reach beyond the few meters in front of our fighting man's face. The version of the game I saw was early. Plenty of stuff is still up in the air, even including, Goodrich confirmed, the meaning of rows of bullets that appear over friendly characters if the player checks those characters' status.What does it mean? Nothing yet, he said. The version of the game I saw included now-standard regenerative health system. Resting leads to recovery, just as it did in Gears of War. A Medal of Honor team that is still sorting out its visual presentation is a team that's not ready to elaborate too much on the game's story. Goodrich said we were seeing the experiences of Tier 1 Operators, the best fighters in the world. Some real life Tier 1 guys have even consulted on the game, though Goodrich wouldn't detail what they asked to be added or changed in the game. He did assure me that the single-player campaign of Medal of Honor isn't meant to be afterthought. He knows some players ignore shooter campaigns and jump right into multiplayer, but Goodrich seemed even more excited about the chance to make a great single-player campaign with no distractions. "Naturally in development, developers, whether they think this or not, will focus on what they're good at," he said. "If you find a developer that's really good at single player they'll focus on that. Multiplayer becomes sort of an afterthought." The two-studio approach is meant to get the focus and the diversity of expertise all on the same game disc under the same name. I wasn't shown Medal of Honor multiplayer at this event, which is being made by a different development studio, DICE. We didn't learn much about who, specifically, we would be in the game nor what this story of brotherhood will be like. But it is upon this foundation, upon the shoulders of Medal of Honors that came before, that EA is constructing this ambitious two-team game. Using two teams for a game's two halves seems like the kind of thing you do if, upon the foundation, you wish to build something grand. Medal of Honor has about six months to prove that it can be worthy of that kind of support. Medal of Honor is set for a fall 2010 release on the PC, PlayStation 3 and Xbox 360.